Hannah Genders celebrates the diversity of the Malvern Show. I really think the organisers had got the “feel” of the Malvern Festival right this year. The weather helped, soaring to 23 degrees by the Sunday, but there was also some great music (not that I’m biased; my husband Mike was playing), good food and plenty of areas to sit and enjoy the wonderful views up to the hills. I understand they had record visitors this year, around 90,000 through the gates. As you know from last month’s article I was privileged to create the stage in the celebrity theatre for this year’s show, and I wanted to make it colourful and have a real festival feel – which, I think, due to the hard work of the whole team, we managed. It was certainly talked about and admired both by the public coming into the show and the celebrities who used it. The sculpture by Matt Sanderson was truly outstanding and a real eye-catching feature, especially with the orange screen as a backdrop and the cups that were planted up with different herbs. It was blogged by a journalist as being the best thing in the show so we were all thrilled. The mosaic pots worked really well and tied all the colours together; these were planted with simple bay pyramids to fit the edible theme and not detract from the pots. The crates looked great and rustic enough to fit in with the whole theme, and the vegetables and flowers worked particularly well in these. The team at Say it with Wood built the stage and did a fantastic job – we realised how good when we had to take it apart at the end of the show! It was really solid and the metal troughs at the front (which I’d borrowed from a friend’s farm in Alcester) were great when planted up and tied in so well with Matt’s sculpture. The vegetables we used were lots of heritage varieties and very colourful. Not all the edible flowers came out in time so I had to use other perennials for some flower colour, but I would guess a good 60 percent of it was edible. All the vegetable plants have gone to a school for their new garden and most of the plants have now been reused or sent back to the nursery. The gardens this year were of a very good standard with a record five gold medals being awarded, and the best in show going to Mark Eveleigh for his Macmillan Legacy Garden. My favourite was Peter Dowles’ garden, “Reflections of Japan”: it was exquisitely executed and felt very calm and restful, with a central pool surrounded by mature Acers. The planting “borrowed” the Malvern Hills landscape as Peter and his team had cleverly linked the backdrop in – this technique is called “shakkei” in Japan. The whole garden would have sat happily on Main Avenue at Chelsea and Peter has one day off before going to the Chelsea build for this year’s show. It won a very well deserved gold medal. “Time is a Healer” was a garden created for Primrose Hospice in Bromsgrove by Martyn Wilson, with its central benches indicating how much the hospice community offers help and support during bereavement and loss. When I spoke to Martyn he was rather disappointed to be awarded a bronze medal, but the garden was certainly liked by the public – winning the People’s Choice Award – and got a lot of attention for its cause. Click here for more about this garden. Another gold medal went to Villaggio Verde, for their “Garden of Romance” set in Italy, it had cloisters and a little simple church area set up for weddings – it was quite amazing to think they had created it for the show as it was on a large scale. Jason, who owns and runs Villaggio Verde, told me it took five weeks to construct and will take a further two weeks to take down and clear the site! Their business is a nursery that buys and sells olive trees and other Mediterranean plants, and all the planting was grown by them and very romantic with roses and lavender en masse, edged with rosemary. It worked particularly well in the sunny weather. 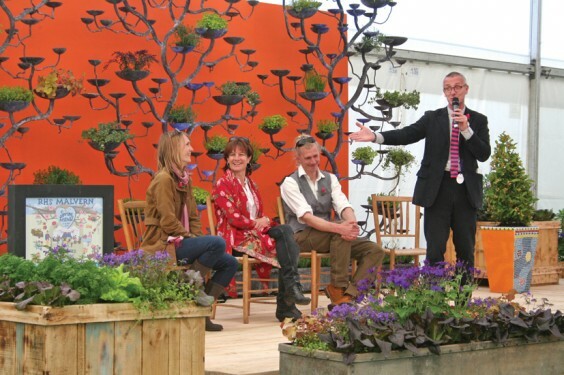 We managed to get our stage feature taken down in a few days so now it’s off to Chelsea for me, to see what the next trends are in the gardening world. Above: Hannah (seated, centre) on stage with designers Emily Sharpe and Matt Sanderson and host James Alexander Sinclair.